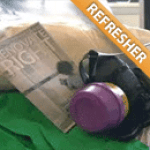 This Lead Renovator Refresher courseprovided by Seagull Environmental is accepted for renewal of your existing valid certification for 5 years in most states! Many EPA-Authorized states require RRP refresher training every 3 years. Certified Lead-safe Renovators are required to complete the refresher training prior to the expiration date of their original certification or start over by taking an initial course. Certification is issued on the spot. No mail and no waiting! Additionally, Seagull is the only provider that offers free 24/7 consulting for all of its students after the course.